The Lifespan TR1200-DT treadmill desk is you answer to efficiency, productivity, mental alertness and physical fitness – all at the same time! This treadmill desk provides a wide work area where you can crunch some numbers or engage in your computer while doing your regular walks. The TR1200-DT treadmill desk is designed to improve the productivity of employees who don’t get enough exercise due to tons of workload. Measuring 46.5 inches wide, it is attached to the treadmill to provide you with a work station while working out. More than just a workspace, the TR1200-DT treadmill desk is also designed with cool features that go with your treadmill, including readout display and padded armrests for extra convenience. If you want to increase your productivity and save time, the Lifespan TR1200-DT treadmill would allow you to work while working out. Designed with a large, convenient space, the TR1200-DT treadmill desk can support your laptop, printer, files, and other electronic devices and allow you to manage them while doing your regular treadmill routine. The Lifespan TR1200-DT treadmill is constructed to feature your typical Lifespan treadmill that’s durable and high-performance, with a desk on top of it measuring 46.5" wide and 31" deep, providing you a work surface where you can place your laptop, files, books, and other work materials. It still comes with a console that is conveniently located in front of the desk so you can easily adjust your workout settings without taking so much space from the work area. It also features a readout display that shows your workout stats including time elapsed, distance, calories burned, and number of steps done with the help of the built-in Intelli-Step pedometer feature. For added convenience, the TR1200-DT is designed with padded armrests located across the front of the desk. This should provide your arms extra comfort when typing or simply using your computer unit while doing the walks. 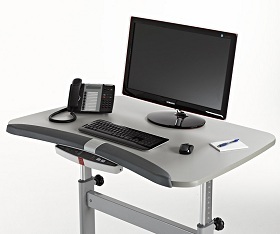 While some treadmill desk only supports limited height of users, the TR1200-DT comes with a desktop height adjustment between 40 and 56 inches, ergonomically supporting users who stand from 4’10” to 6’8” tall. Specifically built off the Lifespan TR1200i treadmill, the TR1200-DT model features the standard shock absorbing deck suspension that helps reduce stress on joints and provide a more comfortable walking experience. The machine’s motor allows speeds up to 4.0 miles per hour for maximum workout while working. The biggest weakness of this machine is that it can only be used for walking. Since it comes with a treadmill desk, it would be dangerous to run while doing your work at the same time. So for those that are looking for a more intense workout, I suggest you visit our best treadmills page. Lifespan is known to be one of the leaders in making high-quality, high-performance treadmill machines. Topping these off with a treadmill that comes with a workstation, Lifespan promotes productivity and physical health even when you think you have no time to work your body out. Let the Lifespan TR1200-DT treadmill show you how it’s like to work while working out! Note: If you already own a treadmill and you would like to have treadmill desk, I recommend you read our review of TrekDesk treadmill desk. 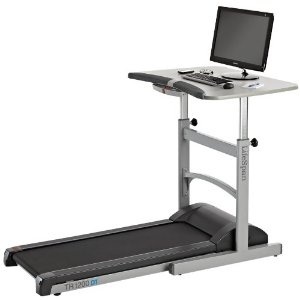 It is a treadmill desk which you can attach to your regular treadmill. Desktop Dimensions: 31" x 46.5"
If you plan on buying a Lifespan TR1200-DT treadmill, I suggest you buy from Amazon. It is currently being sold for just $1,299.99.